With a new technology for adhesive bindings in the smartliner240, palamides breaks completely new ground. The so-called smartflat technology means that adhesive bindings can be bound in an environmentally friendly way and a perfectly flat lay-flat is achieved. In addition, almost all paper qualities and gramatures can be processed. The innovative smartflat technology processes the spine of the book quite differently from conventional perfect binders. The smartflat spine processing enables the individual pages to be firmly anchored with the new hydrosive adhesive "SF100". This combination gives the book spine for the first time high and unique flexibility, stability and the coveted flat lay-flat. Perfect binders that use hot glue or PUR mill the book block and usually provide it with notches to increase the contact surface for the adhesive. After milling, the book block is guided over a glue roller or glue nozzle and provided with a cover. The binding result also has a high tensile strength, as it is held in place by the clamping effect in the spine. The impact behaviour of books from these binding processes is often criticised. In addition, the production of these books is very energy-intensive and partly associated with the release of toxic vapours. The smartliner240 is equipped with pliers into which the book blocks are inserted by hand. The tongs guide the book block at constant speed via specially developed smartflat components for innovative spine preparation. An important component of the smartflat technology is the hydrosive adhesive "SF100" which is applied from a closed system via application nozzles. The manual cover feeder can hold several covers. The automatic bar creasing, with which up to 4 creases can be set, has a simple but clever moistening unit. The cover is placed on the spine of the book from below and from the side via a pressure plate. 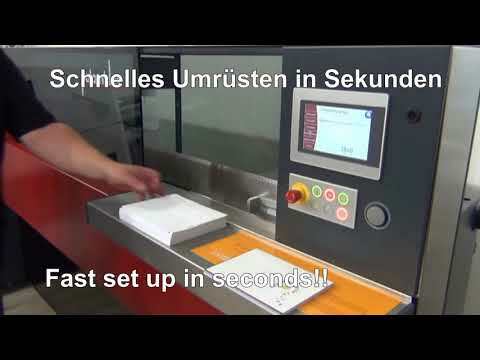 The uncut products dry in the automated book delivery. After approx. 5 minutes they have reached the required stability and can be removed. Questions about the smartliner? Arnd Riewe will be happy to advise you.